There are (probably) more important things out there, for example, my daughter has twisted here knee-cap and me being here in Washington DC makes me a bit worried if all is well in Holland (be assured, I have called multiple times, but its not the same as being there) . …but in all, I can’t help myself and its worth it. Its all about passion, no title really needed, I will do it anyway. 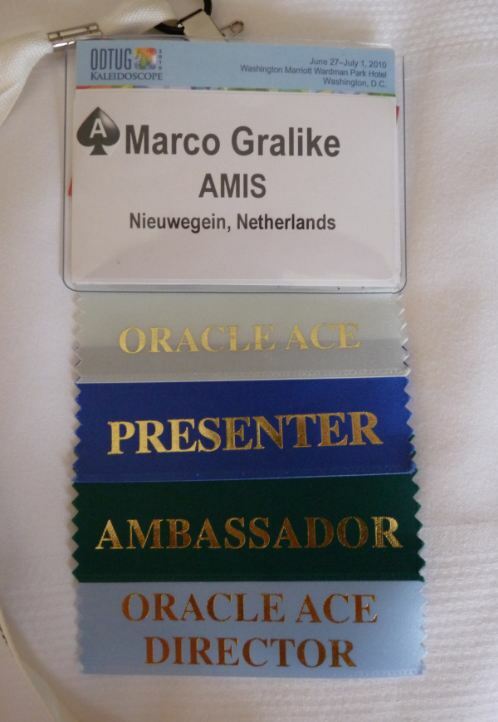 So during ODTUG, after signing up for some extra ambassador duties, I could add an extra ribbon which I really appreciate because I know that the people who nominated me, don’t nominate someone very easily. I’m honored and really appreciate it. It will help with getting people more into Oracle XML DB. My thanks go out towards the Oracle XML DB Development team who kept supporting me despite I can be very “intensive”, as a Dutch friend described it lately, and those colleagues that still want to know how this all works in Oracle XML DB (they haven’t given up on me yet, me being a “mental case”). Oh, wow. Big congratulations, Marco, and *completely* deserved. Sorry I didn’t notice this sooner but a friend died last weekend so I haven’t been following blogs.